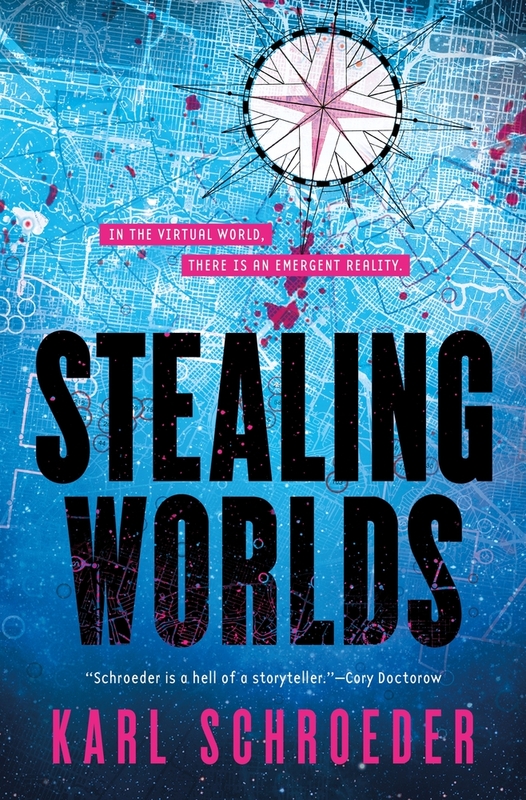 From Karl Schroeder, author of Lockstep, comes the near-future, science fiction, hacker’s heist, Stealing Worlds. Sura Neelin is on the run from her creditors, from her past, and her father’s murderers. She can’t get a job, she can’t get a place to live, she can’t even walk down the street: the total surveillance society that is mid-21st century America means that every camera and every pair of smart glasses is her enemy. But Sura might have a chance in the alternate reality of the games. People can disappear in the LARP game worlds, into the alternate economy of Notchcoin and blockchains. The people who build the games also program the surveillance networks—she just needs an introduction, and the skills to play. Turns out, she has very valuable skills, and some very surprising friends. “Karl Schroeder seizes cyberpunk traditions and larps them into the onrushing era of blockchains, sentient contracts and rapid-paced convulsions of reality!”—David Brin, author of The Postman and Existence. KARL SCHROEDER lives in Toronto, Canada with his wife and daughter. He is the author of New York Times Notable book Ventus as well as the acclaimed Virga steampunk space opera series. A member of the Association of Professional Futurists, Karl consults and speaks about the future as well as writing about it.